Minnie tells me more about her school activities such as organizing the Junior Red Cross and studying “the four divisions of mankind” in geography. Tells me how proud she is of me. I am going to write to you before supper tonight. I have a lot of work I want to do after supper, getting the review work ready for the children. Well I wonder if you were moved today or not. Seems funny not to have any idea where you are. Wish you were off on a pass. I would like to entertain Mr. Ward C. Griffing this evening. I’m feeling better (that is, in better spirits) this evening that I have since I’ve come up here. I came home from school real early [and] cleaned all up. [It’s the] first time I’ve got all the dirt washed off that I got yesterday coming up. I guess school teaching must agree with me. I’m weighing more than I have since I started into high school downtown. From what little teaching I’ve done, I think I would like it fine. But I wouldn’t want to have to [teach] all my life. In geography today we were studying about the four divisions of mankind and when we were talking about the two divisions (light and dark types) of the white race, we discovered I was the only brown-eyed person in the school. That sure tickled the kids. They said I was of a different type of the race [and] I wasn’t like the rest of them. I think we must be going to have onions tonight for supper. I smell something pretty strong. I’m sure hungry tonight [and I’m] anxious for suppertime to come. If you have the blues tonight Boy, I sure wish I could talk to you. I bet I could make you feel good. I feel so happy myself – I don’t know what about, everything in general I guess. I catch myself just smiling at your picture sometimes. The next thing I expect I’ll be talking to it. I’m mighty glad I have it, but it’s a poor substitute. When I kiss you I generally get one (or 2 or 3) back but I don’t when I kiss your picture. But you smile at me every time I do tho. I left my watch down home and I sure do miss it. I need it up here but I guess I can get along. I’m not going home again till you get off unless something makes me change my mind. We are going to organize Junior Red Cross tomorrow. One thing they want us to do especially is to gather up all the seeds from fruits we use – especially the peach seed. They use the carbon from the seeds to make gas masks better. They seem to think it’s pretty important and it’s something the kids can easily do. I get my $65 check Friday. I need it. I’ve only money enough to pay for sending five more letters counting this one. So I had better be getting it, don’t you think? I owe [my sister] Bertha two dollars and Mama three and my board. All the rest goes in the bank to stay till my school’s out with the exception of Xmas. I don’t expect to spend more than five dollars the rest of my school term. I have everything I intend to get. I am sure glad I don’t have to pay any more for my board. And this is such a grand place. I got a letter from you today and maybe you don’t think it seems nice to get them fairly often from you? I sure think you are doing well by me. My, but how I would like to poke you in your ribs, tickle you, and blow in your ears tonight. Aren’t you glad you aren’t around? I believe you used to get almost sore at me for doing that. But I sure like to torment you sometimes. But I would be good to you if I had a chance to be now. Your mother gave me two more letters Saturday – one was the first one I wrote after I came up here and the other one was one I wrote to you March 18th and mailed in College Post Office. Your mother found it in one of your coat pockets. I wish things were evened up a little better. I have lots of time to write you but nothing to write, and you don’t have the time and have lots to write about. But it’s just awful for me to try to write. I sometimes feel like a fool for trying it. But I thought you would be glad to know I keep thinking of you every day whether I have anything interesting to say or not. I’m certainly mighty glad we got to go over to the fort yesterday since you were off all day. After I got as far as home, I was bound I was going over. But the folks teased me so they would suggest the craziest ways for me to go over. I guess Mama told you one, and they knew it made me provoked so they just kept it up Saturday evening till I went to bed crying. Then I guess Papa saw how bad I really did want to go so he told Mama he would go over with me. But I don’t care now. I got to go and that’s all I wanted. Glory, but I hope you get a pass soon. I wish to goodness you could next Saturday and Sunday. But any time will do if you only could. I think maybe you can. Luck seemed to be with you yesterday. Maybe it will be again. It was fine to sit on your lap yesterday. I didn’t expect to get to do that again, but I wish we could have just gone on home with you with us. I’ll bet some girls don’t feel very happy after they have visited their soldier boy over there, and feel worried because they think he’s doing things they wouldn’t like. But it certainly isn’t that way with me, Boy. I am proud of you. I know that you strictly obey military orders and I certainly admire that in a soldier. And then you are so good and true, boy. I sometimes think I’m out of luck. But I’m not at all. I’m certainly favored to have such a Boy as good as you are, Ward. And I’ll never believe that there are more like you. I ought to have stopped before I started on this page because I’m afraid it won’t all go in the envelope [as] this is such large paper. I have to write out exam questions for Thursday and Friday. What if when I go to get my pay Friday the board says, “No, we’ve decided we would have to have another teacher. You won’t do.” Wouldn’t I feel like two cents tho. P. S. This letter is long enough to make up for last evening. In 1917, when the United States entered World War I, some of the nation's leading educators and American Red Cross officials evolved a plan for a nationwide partnership between schools and the Red Cross. On September 15, 1917, President Wilson officially announced the formation of the Junior Red Cross, and asked American youth "Is not this perhaps the chance for which you have been looking to give your time and efforts in some measure to meet our national needs (in wartime)?" With membership costing only 25-cents per student annually, Junior Red Cross enrollment reached 8 million within its first year and peaked at 11 million by 1919. Of greater importance than the number of elementary and secondary students who become members were the many vital services they performed on their own and alongside adults during the War. They made and collected clothing for war victims, produced hospital supplies, and built furniture for hospitals and convalescent homes. For youth in war-torn areas overseas, they prepared and sent "Friendship Boxes" (containing school and personal items). On the home front, they promoted food conservation projects and worked in Victory Gardens (vegetable gardens that added to the nation's food supply). They also stepped in to help local chapters perform their regular functions, including first aid training and disaster relief and they participated in all Red Cross membership and war fund campaigns. 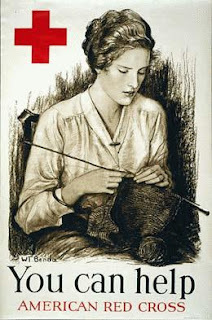 The Junior Red Cross made 10 percent of the total value of Red Cross products produced during wartime. One of the projects of the Junior Red Cross was to collect peach seeds. They were pulverized for their carbon and used in the canisters of the gas masks worn by the Allied forces in France during WWI. I tell Minnie about watching a regimental parade and leaving the base without a pass to go into Junction City. I received the nice long letter you wrote Friday tonight & as usual was very glad to get it. I suppose you got back to your school alright & things are running as usual. We haven’t done too much – didn’t drill at all. We carried a few tents down to that camp on the west because a regiment from [Camp] Funston came out this morning to shoot on the range. This afternoon we had to dress in our uniforms & march over to the parade grounds near where we were yesterday & watch another regiment parade. I presume they think we can learn how it’s done by watching others do it, like babies. Last night about dusk, I went with Sergeant Spear to Junction City. He wanted to take some films to be developed & wanted someone for company. It shure seemed good to get out of sight & sound of that old camp. We met our company commander on the street but there was such a crowd, he didn’t see us & it is a mighty good thing because neither one of us had passes. I wouldn’t have gone with one of the [other] men but I thot it would be alright with him. A few more of the fellows were called out today. I expect a large percent of what is left will be transferred tomorrow or Wednesday. I will shure be glad when I know where I will be. I went to see the company commander today, but he was out. But I talked with the clerk that was in there about the college proposition [and] he said that they had received nothing concerning it & he advised me to wait until I got into my permanent organization. By that time it will be pretty late & I’m afraid it was all bunk anyway because there are a few other college fellows here & they don’t know anything about it. I hope I get transferred to [Camp] Funston & then it won’t make much difference. Say, you ought to see me now. Last evening after you folks left, I came back to camp & ran across a fellow cutting hair so I waited & got mine cut. You couldn’t run your fingers thru it now if you had the chance. It’s about half an inch long at the longest place. I don’t have to comb it anymore. I hung out a big wash today during my spare time. Well. I won’t have much news to tell until I am transferred. It shure was good to see you again yesterday & I shure hope & pray it won’t be the last for a year or two. But if it is, it is & that’s all. Minnie writes to me upon returning to Sherman after visiting me at Camp Funston. Says her “Papa was sore” because she returned late. Well I am home. Papa and I left home about 6:45 p.m. Papa was sore because I didn’t get back so he could start at five. 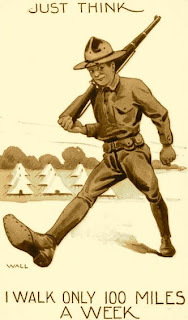 We got home just six o’clock and I was sore because I couldn’t stay at Camp [Funston] longer. I didn’t want to leave you at all this evening. I just felt like I couldn’t. But I sure did enjoy every moment we were together. It all seems like a dream already. Somebody else has to write with a pencil tonight. My, I just think of so many things tonight that I wanted to say to you today – things that I wanted to say when I saw you, but I was so taken up with you that I didn’t think of what I had to say at all. I do hope you will get a pass. I have been thinking all the time you would have one next Sunday and we could be at home together once more, but I’ll be mighty well satisfied if you can get one anytime. I’m so anxious about you now to know where you will be sent. I wish so much that you would try and be allowed to enter here at college and then again I think if you are sent to Siberia maybe you would show a better chance. Anything, boy, just so you come home safe and soon. I believe I will just be wild. I’ll be so happy when that miserable mess is over with and you can come home again to stay. Well, I must go to bed. I’ve ridden 60 miles today in a car. I’m pretty tired. I got all ready for bed and tonight I would sit down and write to you but I’m almost asleep and too much taken up with the dearest boy on earth. P.S. Your picture sure is a life saver, boy. Minnie tells me she feels like “a bird in a cage” – thinks of nothing but school and her soldier boy. Well honey boy, I just about played off on you tonight. I cleaned the school house and furniture so well that I didn’t get home till supper time and I haven’t spent any time in my room. It’s getting late now to write. I’ve just been telling Mrs. Parkerson all about the Girls and Boys Club on College Hill. I told her all about the first time the boys entertained the girls [on] Thanksgiving, about the Christmas Kid party, and the watermelon feed. I told her everything from beginning to end. I’ll bet that bunch would all like to get together again, don’t you? Didn’t it clear off nice? But it sure is cold. I would like to go to bed and just stay there till the winter is over. I dread it so. I’m worse than a feeble old man about cold weather. I hope your folks are going up to Camp Funston Sunday. If they do and will take me along, I think the folks will come for me tomorrow evening – if it’s perfectly clear. My, I’m anxious to go. It seems so long since last Sunday. I certainly hope you will get off a week from Sunday. If you can get off Saturday and Sunday, and if you come to see me Saturday evening, wouldn’t we pull a big chair up to the fireplace (if it stay this cold) and just talk and talk and talk. But there are so many “ifs.” My, but I wish we could be together again that way….lots of times. School is going along too smooth. Not enough happened today to make it exciting. I have to get to school pretty early now days to make a fire, but I haven’t minded it in the least so far. I can keep the fire over from one day to the next. You asked how I would like to see you coming in some evening, Saturday or Sunday. Well, do you remember how happy I was one time when I was away from home and saw you walking over the hill? Well that was [nothing] compared to what it would be now. Why boy, anything like that is too good to be true. I’d give anything to see that smile right now [that] I saw that day. I have your picture right before me and it sure looks just like you – the way I like to think of you, but it isn’t the real person. I have only been out about an hour away from Parkerson’s in the last three weeks. I’ve been staying here (excepting on Sundays) so I don’t have anything to write about excepting the two things that are on my mind – my school and you (mostly you). There isn’t anything to write about my school part of the time so I half to write about you. That certainly suits me fine, but I don’t know whether you like it or not. I sure feel like a bird in a cage sometimes. This is different from what I’ve been used to the last seven years. But I like it because I know I don’t do anything wrong. It’s such a good life. I know I’ve got to be just the best I possibly can be in the school room, and here at Parkerson’s. I never get a chance to do anything out of the way, except maybe write something to you that afterwards prick my conscious. But I will always live as near right as I possibly can because I just live for you boy, And when you come back, I want to be just like I was when you left – only a whole lot better. I expect you will soon be out of that Camp. I’ll be glad, if you have it any better and don’t have to leave soon. I guess you have your bunk and all fixed up by now so it’s pretty decent compared to what it was. Mrs. Parkerson is going to teach me to knit. I’ll have lots of time when I get that beastly old book outlined. [P.S.] If this letter sounds choppy and funny, don’t be surprised [as] I’m half asleep. This is the house on College Hill where I grew up and where my mother Hattie, twin brother Willis, and niece Carol Cunningham lived while I was in the service during WWI. My grandfather, Rev. James S. Griffing, had the house built in 1870 when he moved his family here from his farm near Tecumseh, KS. The area was known as College Hill because the original Bluemont College building, the precursor to Kansas State University (KSU), was only about a mile south of this farmhouse. The house still stands and is across the road from the KSU baseball fields northwest of Manhattan, KS. 'Til the boys come home. I tell Minnie I did some “pretty fair shooting” out on the firing range and then speculate about being transferred. I received another of your letters today & I am shure glad that you think enough of me to write every day if you are busy. I have been on the firing line most all day. We got out there at daylight and I scored until about eleven o’clock when I had to stop until 12. I did pretty fair shooting compared with some of the men, but it was nothing remarkable. This afternoon I scored again. One man a little ways to my right was injured. The bolt of his rifle blew out or something & tore his face a little. I don’t know how badly. No one was seriously injured tho. About 20 or 30 men were transferred from our company today & were sent to [Camp] Funston so I don’t believe I will be sent to Funston. I will probably be transferred as soon as I get over my last shot which I will get tomorrow. I shure hope you can come up next Sunday after my squad will be on guard. I think I can get off tho. How I long to be with you kid, but as you say, after this old mess is cleared up & the dishes washed, we will be glad that we sacrificed as much as we did even if it is not the supreme sacrifice as many before us have had to do. [P.S.] If you have time, you might want to make me some chocolate fudge. Minnie tells me she thinks about me all the time and that it's nobody's business "but our own" if I kiss her in public. I had two letters from you today and I was nearly “tickled to death.” My, but it was great. I couldn’t wait till noon. I opened and read the first page of one of them right away. I bet the children [in my school] wondered what was in that letter that made me change my attitude so quickly. Just before, I had been kinda peevish at some of them and I got so goody goody all of a sudden and nothing could have made me mad, but I was just so happy. I want to see you so much Sunday but the folks won’t come for me unless it is perfectly clear [weather] Saturday evening. They won’t risk coming on Friday. Don’t think it’s because I don’t care to come if I don’t get to. Why, I’m just wild to come. I want to see you as much as I possibly can before you leave – if you do. Just had supper – 7:35 P.M. Boy, please don’t say things anymore like (memories remind you of a time you may never see again) and other things that infer you may never come back. Why, you don’t know how it makes me feel Ward, or I know you wouldn’t. I never think for one moment but that you’ll come home. I couldn’t if I wanted to. Why, I know I would just go crazy if I didn’t think you would. It’s just awful. I can’t think but what you will, but just all the time I have a feeling of fear. Why, sometimes I think I won’t be able to stand it. If you were only near, then it wouldn’t be half so hard. But you’ve just got to come back, and you think you will, don’t you boy? I wish you were the girl and I was the boy. You said it seemed a long time to you since we have been together. Well it sure seems ages to me and I don’t know what I would give for another chance. And I keep looking forward to the time we can. Surely you will get off by next Sunday (a week from next). Mrs. Parkerson called me to come down and have some melon with them. I’m gone. 9:30 P.M. – Melon was fine. This is sure a cut up affair, but I’m sure glad she called me. I was sitting here crying before she called and now I feel different. She wanted to know what in the world I did up here. I didn’t tell her that I spent most of my time writing to you when I’m in my room. I have a fine big room. But there’s a big framed picture just above my bed. 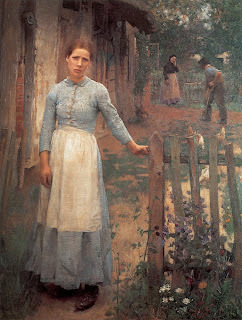 It’s a picture of a girl standing all alone in an open gate waiting for someone. It’s pretty but I don’t like to look at it very well. I’m too lonesome. Talk about getting homesick. I haven’t been hardly homesick at all for the folks but my I have been for you. Won’t we be the happiest people on earth tho Boy, when you come home? If you ever get out of the Army, you’ll never get many miles from me again. I’m sorry boy that you have to wait in line and see others get mail and you not get any. That is something I can do and now since I know your address, I will send a letter everyday and more than glad to if it will make you any happier, Ward. You know, Ward, how seriously I’ve always objected to your kissing me [in public]. I wouldn’t miss one kiss from you for anything in this world. I imagine our folks were rather shocked or surprised, “But it’s no business but our own.” If they don’t like it, they can turn the other way. I sure want to see you Sunday. An American Expeditionary Force was sent to Siberia during the late stages of WWI. I tell Minnie about nearly freezing to death on the windswept rifle range. I must hurry & get this written because we must have lights out in 15 minutes. We are very late tonight because we were out on the firing line this afternoon. About ½ of the company – the brightest I suppose – were chosen as scorers to keep the score of the shooters, & I was one of them. At 12:10 we were told to be in line. At 12:30, [we were to be] ready to go out whether we had our dinners or not. I got my dinner & swallowed it whole, washed my mess kit, but didn’t stop to wipe it [and] threw it in my bag. [Then I] grabbed my rifle & the whistle blew. We had to lay out on the range from then until nearly dark. The wind was in the north & was as raw as a piece of beef. Then we had to march in & get our suppers. We will have to get up at about 4 o’clock in the morning & go out on the range again. I expect us scorer’s will shoot sometime tomorrow. Nobody got seriously hurt today & I hope they won’t tomorrow. A few of the men in this company have received notices to move tomorrow morning & I expect we all will as soon as we get off the range & get our inoculation. You asked how long it takes for me to get your letters. I got the letter you wrote Monday last night. It shure is nice of you to write everyday & I hope you feel like keeping it up. Camp Republican was located on the floodplain of the Republican River, immediately north of Junction City. Its name was later changed to Camp Forsyth. My mother (Hattie, picture right) fills me in on the news from College Hill and inserts a note from Carol Cunningham, my niece. It is just two weeks ago that you left us. I wonder how long it seems to you. It is very much longer to me. I trust that you have not taken any more cold this weather but it has been so cold that I fear you have. [Your brother] Willis has gone to town to see that Mr. Fisher and they are to have a date with some girls I believe. He has been harrowing all day, walking – said he had not been so tired any day all summer. I thot it too bad he had planned to go away tonight. Mrs. Hudson is sick so the day after we left Mrs. Hutchings, Mrs. Munger, Kittie, Abbie, and I all went over to see her and took some flowers that the club sent her – it pleased her very much. She gave me the socks she has knit for you with lots of good wishes for you. I believe they would feel good on your feet tonight. I am knitting as fast as I can. Will have them done before long. Mrs. Vangilder was just talking with me. [She] said to remember her to you [and] that they all think of you. She is afraid her boy will have to go now – her only boy. I called up the Frey’s today. Bertha said they had not gotten the car fixed. Had a letter from Minnie today. 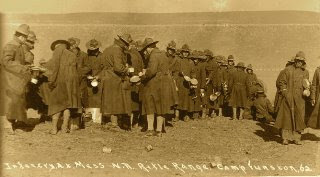 She told them that if there was any chance of going up to [Camp] Funston Sunday, for some of them to go for her Saturday evening. I suppose she has told you all about their troubles and there is no use for me to have done it. She got up there in time Monday morning to ring the 8:30 bell. Carol did not enjoy the day with Edna’s boys. [She] said they were not nice [and] that they slapped her, etc. She says that she will go with me next time [and] that she don’t want to go to Aunt Emma’s again unless I am there. [P. S.] I do not believe that this letter is worth the postage. I think that Carol [Cunningham] is doing fine at school. She hardly talks of anything else at home. She is learning fast. 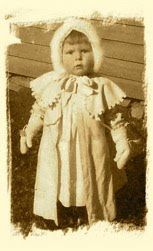 Carol Cunningham, my niece, at age three. Carl Fisher lived on Yuma Street in Manhattan, Kansas. He was the 20 year-old son of Charles Fisher, a conductor on the interurban in Manhattan. Either Mary E. Hudson, the 67 year-old wife of retired farmer Samuel E. Hudson, or Verda E. Hudson, the 33 year-old wife of Harlow K. Hudson (son of the Samuel & Mary). 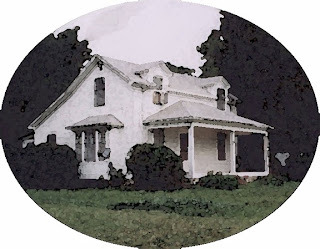 Both families lived in adjacent farmhouses on our College Hill farm. Mrs. Marie Hutchings was the 48 year-old wife of Oliver A. Hutchings who owned a bookstore in Manhattan. Mrs. Hutchings was a native of Denmark. Mrs. Elizabeth Vangilder was a 57 year-old widow who lived next door to my Aunt Mary Griffing and her husband Lloyd Fry. She had one son, an 18 year-old named James Lowell Vangilder. Carol Cunningham was the five year-old daughter of my older sister, May Griffing, and her husband Claude Cunningham. 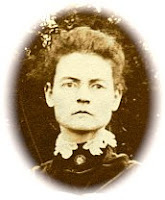 May died from complications in giving birth to Carol and she was raised by her grandmother, Hattie Griffing, until Claude remarried. Minnie tells me she is expected to set up a Red Cross Society in her school. It’s trying to rain and hail here again this evening. By the looks of the clouds I guess you are getting some of it. One of the boys in my school got sick today and had to go home. I stopped in tonight on my way home to see how he was. I guess he’ll be out for a day or so. His mother said she was so glad to hear I was getting along so well with my school. Twenty-one new books came for our library today. I was sure glad. They are fine. We began reading one today. I had a letter from Miss Carey today and she wanted me to be prompt with my monthly report, and I don’t have any idea what report that is. I can’t imagine I’ve never been told about my monthly report. And she wants all the teachers that haven’t already to organize a Red Cross Society in school. I haven’t as yet. We have been pretty busy so far. The boys had a cap scrap today. I just let them go but I thought it would be funny if it didn’t end up in a quarrel, and sure enough – it did. After school tonight I saw Ora and one of the twins fussing and I said, “What’s the matter Ora?” And he said, “They have my cap and won’t give it back.” I said, “Lloyd (I didn’t know whether it was Lloyd or Floyd [Krouse]), give Ora’s cap back to him, and we’ll have no more cap fights.” Lloyd said, “Well I’ll give his back to him when his’n gets ‘Flips.’ Him throwed his’n away and Flip can’t find it. He can’t have this till him find our’n.” I just snorted out, “By who’s orders?” Lloyd began to cry and said he could have it. Altogether a different tune. Then I made Ora get ‘Flips’ cap and they all walked home together the best of friends. Ward, you were not right when you said these kids would use better English than I because they had had good teachers. These children use the worst English I have ever heard in my life. It’s just awful. Only one more sheet of writing paper left. I sure thought today I was getting sick. You know Sunday I said I felt so warm and my face was burning so? Well we had spells of feeling that way every since and tonight when I came home from school, I felt so odd. I sat down for awhile and just felt so tired. I told Mrs. Parkerson I was just tired out. Then I came upstairs and got to feeling so dizzy and sick I had a notion to tell Mrs. Parkerson that I couldn’t eat supper, but finally I did go down and ate a big supper and now I feel fine again. Only my face feels so flushed. I may be taking a cold again, I don’t know. I am sure planning big on your coming home a week from Saturday. Surely you’ll be able to by that time. I’m just going to work my head off making out grade cards, etc., so I can come home. You know it will be the end of the first month. Reppie Carey was the 57 year-old County Superintendent of Public Instruction who lived on Poyntz Avenue in Manhattan, Kansas. Minnie tells me she has the best order in her school of any in Riley County. Well for the first time since I’ve been up here, I don’t know what to write to you. I generally have a dozen things I want to say all at the same time. It’s trying to rain here tonight and I bet it’s pouring over at Camp [Funston]. The clouds over that way look like it might be. I expect you’ll get a chance to go swimming. But it’s not a very pleasant time of year to do that, especially if you are not feeling well from vaccination. I only have enough paper for two more days. Then if I write, it will have to be notebook paper or scratch paper. I’m going to send a letter everyday this week. I know if you aren’t feeling well and have to lay around, you will like to get a letter if you are anything like me. I remember last winter when I had the measles. I was so glad when I got a letter from you. But I can’t write the kind of letters you can. That was just one of the nicest things you were always doing that made me think so much of you. You always did the right things at the right time. Just when I was least expecting it, you would be doing something that would make me so happy. School went just fine again today. I had to give a couple of my 7th grade boys a good shaking, but that’s nothing. I get sore enough to do almost anything once in awhile. I don’t abide strictly by the rules of the school because they are old enough to know. And I don’t care if I do say it (it most likely isn’t because of my teaching) I have the best order in my school. I just wish you could visit it. College Hill was a mean school compared to this. I better not brag [cause] they may get worse. I have a couple of boys that don’t have any sense at all, and never have their lessons. They cause me more worry than anything in my school. If I had the chance now to snuggle up by your side and take your watch to “tick, tick” and then sneak the picture out in the back of your watch, you wouldn’t scold and make me give it back now would you? You don’t use that watch since you have your wrist watch. Do you still have to climb up those hills and carry rocks down to make the road?